It is about time I wrote a review of Adelaide's best coffee bar - I go there often enough, rave about it on Facebook and to all my friends. Smooth, mild, creamy coffee without harsh bitterness or any tangy aftertaste, delicious, quality food with all the right combinations of flavours and served with a funky flair, a trendy and comfortable setting – Bar 9 has it all. Most coffee connoisseurs will be familiar with Bar 9 and it's earned its reputation and the weekend line ups for good reason. The owner and staff are totally committed to coffee and the whole experience at Bar 9 oozes this passion. They have teamed with specialist boutique roaster 5 Senses to deliver at least two blends each day and also use an array of brewing methods (see their Brew Bar page for more information). Bar 9's focus on providing a premium experience is carried over into the uncomplicated and well thought out food menu that makes it a destination for more than just your caffeine fix. I always start my visit to Bar 9 with a macchiato, and I'm yet to be disappointed by this velvety and creamy espresso marked with milk. Some of my fave dishes have included the gluten free muesli with yoghurt and caramelised pears, served modishly in a jar, as their juice is too. Being vegetarian, I've altered one of the seasonal specials to exclude pig – leaving goats curd, fig, pistachios and honey on rye. 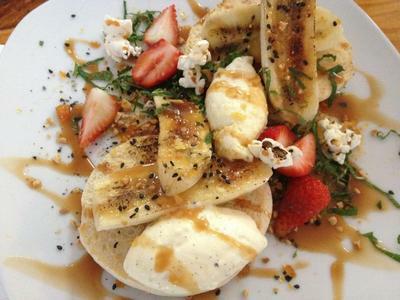 And most recently, their special of torched banana, salted caramel, peanut praline and popping candy blew my socks off. Being somewhat health conscious and because we go out for brunch so often, I don't usually indulge in such a naughty and decadent dish – but I'm glad I did. The perfectly ripe banana, sweet caramel sauce, nutty praline and fluffy quenelles of cream on thin English muffin were a perfectly balanced and moorish combination of flavours, with an exciting explosion of textures including the popping candy. And despite being very sated after my meals, if at all possible, I squeeze in a latte. The guys at Bar 9 use Tweedvale milk – a local Adelaide Hills company who care about their small herd of cows, resulting in high quality milk that is also non-homogenised. It's great for a Melbournian-wanna-be like me that Adelaide's coffee culture is growing, with Melbourne-esque cafes like these popping up all around the place. Average coffee doesn't stand a chance with places like Bar 9, Taylor Blend, Espresso Royale and A Mothers Milk (just to name a few) serving up premium tea and coffee, investing in state of the art machinery and baristas who are passionate and knowledgeable about their trade, with scrumptious food and boutique settings to boot.